I love making a dinner that cooks long on its own…. something that takes short bursts of attention and ends up being incredibly tasty. This recipe could probably have been done in the crockpot, but I chose to start it in my large Calphalon skillet and just cooked it that way for the afternoon. I started with two packages of “sale beef” – one was a packet of beef strips for stir-fry and the other was a packet of stew beef. Since I pulled both out of the freezer in the morning, I chose to slice the beef while things were partially frozen so the cutting would go faster. Once the beef was sliced, I sliced a vidalia onion and left both items on my cutting board for a moment. Using my large Calphalon skillet, I heated one T of butter and one T of olive oil. When this was sizzling, I popped both the beef and onions in the skillet to brown. The kitchen started to smell wonderful, so I popped in three or four garlic cloves and then put the skillet into the oven at 350 degrees for an hour or so. When I went back to the skillet a little later, the meat and onions had started to carmelize, so I added some James River Cellars Rad Red (you can just as easily use a Cabernet Sauvignon, a Cabernet Franc, or a Meritage for this dinner), as well as some salt and pepper, and popped it back in the oven. At the next look, dinner was looking a little soup-y, so I shook a spoonful of flour over top and stirred it into the sauce. Note: make sure to taste your food along the way – it’s much easier to adjust the flavors throughout the cooking process than to dump in a spoonful of garlic salt at the end. When dinner was almost complete, I tossed in some frozen peas, stirred them into the sauce, and returned the skillet to the oven until the peas were cooked and dinner tasted “ready”. I warmed up some rolls, but you could also use pre-made rolls or breadsticks, depending on your family’s preference. My favorite part of this dinner was the fact that I could be doing other things throughout the afternoon and dinner still turned out fabulously. The beef had a rich, deep flavor and the sauce that I had at the end was perfect when served over a baked potato (as pictured) or over pasta (as my husband preferred). Either way, dinner was a success and this recipe became an instant favorite. I hope you’ll try making this for your own family and see if it doesn’t become a favorite for you as well. Enjoy! 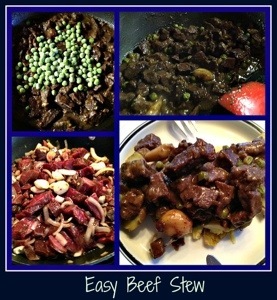 This entry was posted in Cooking, Recipe, Wine and tagged Beef, easy recipe, James River Cellars Rad Red, weeknight dinners.